Aware that many of its visitors for Les Grands Jours are jet-lagged, the BIVB puts on a light, casual dinner in Chablis for our first night: 13 courses, served on a buffet, which means you can get up and leave any time. 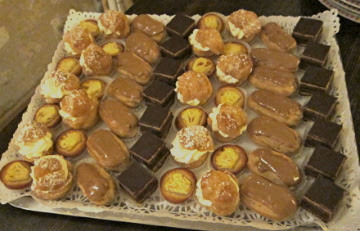 Two of the writers at my table said at the beginning they were going to leave early, yet they ended up having eclairs and coffee at the end like everyone else. Though we're in Chablis, the wines are supposed to represent all of Burgundy, so we had only 2 from Chablis. Six of the 13 wines we were served were Premier Crus. But the standout was not. 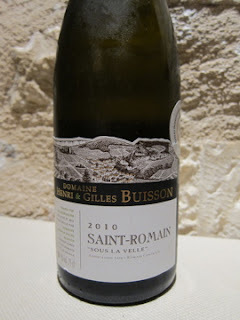 Domaine Henri & Gilles Buisson "Sous la Velle" Saint Romain 2010 was the best wine of the night, with an earthy, leesy nose, generous lemon fruit, a sensual mouthfeel and good balance. 95 points. I hit the table pronouncing my love for it and was embarrassed by my vehemence, but later learned it won the plurality of votes at our table as the best. I have the last glass of it beside me as I type this from my bed. This is why I decided to live-blog this: I don't know anything about this wine, other than that it's great. The region isn't one of Burgundy's most exalted. Here's the winery home page. It looks like the wine should cost $25-$30 in the US, but it doesn't look like any US stores have the 2010 yet; in fact, the retailers I found who carry the brand are still selling the 2007. I'd be happy to give that a try. Domaine Catherine & Claude Marechal Bourgogne Aligote 2010 doesn't appear to be in the US at all, which is a shame because Aligote is usually cheap. This is a stunner if it's under $20: very well-balanced, with an earthy nose, good fruit and chalky minerality. I kept going back to it rather than drink the next 5 wines we were poured, all of which had much better geographic credentials. Some importer needs to bring this in. 91 points. Domaine Alain Geoffrey Domaine le Verger Chablis 2010: Driving through Chablis on the way in, checking out the famous rocky soils, so white in the rain that the vineyards look like stark artwork, made me crave Chablis like a drug habit. This wine has a musty muskiness to it that you have to decide whether to like; I decided I did, as it gave me that chalkiness and restrained lemon peel fruit I dreamed about during my nap. It looks like a single shop in New York carries the '08 vintage of this wine for about $30. A tentative 91 points. Domaine Michel Juillot Clos des Barraults 1er Cru Mercurey (blanc) 2009: They served this with dessert, which was an injustice -- hardly any wine goes with chocolate cake and coffee eclairs, and certainly not Burgundy. A fellow writer said it was his favorite of the night and I'm glad I rallied to pay attention: it's toasty and lemony, well-balanced, and not going to get great tasting notes from me under the circumstances. I found the '04 in a single shop in Seattle for about $40, but can't give a good opinion on how this wine might taste five years from now. This could be a theme of the week: while '09 was the second vintage of the century in Bordeaux, it may actually have been too ripe in Burgundy, and opinions split on a Meursault I thought was too big. The Juillot wine, above, was my favorite of several '09s we were served because it wasn't too big. I know some people welcome rich white Burgundy, but I live in California; if I want a very ripe Chardonnay, I have other options. Food-wise; it won't be a surprise to learn folks in Chablis know how to make a good gougère. I was accused of being an "aspirateur" (vacuum cleaner) for how quickly I scarfed mine up. About fist-sized, soft and collapsing to the touch, it would have made any wine taste better if I had held onto it long enough. Filets of herring had been smoked so intensely that their inherent fishiness was merely a background note, yet they maintained their fresh mouthfeel and appearance. Imagine biting into a piece of sushi and tasting juicy smokiness. When asked what she was eating, one of my colleagues replied, "I don't know, but it's smoked." And great. Soumaintrain cheese spread on a thin slice of toast had the perfect balance of creamy milkiness with a hint of earthy adventure; I went for two. For me, the greatest thing about dining in France is the expectation of good cheese at every meal. I now regret even opening the monterey jack I was served on the plane. Andouillettes de Chablis is a kind of sausage that locals apparently use on foreigners much the same way Japanese use natto: to see what you're made of, and laugh at your disgust. It's a funky sausage that makes you aware that it came from a sweaty pig that rolls in muck. 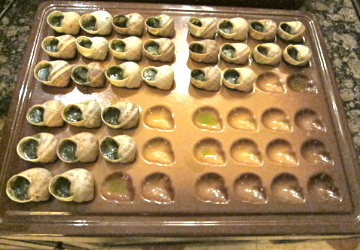 When I bit into it, I noticed that the French people at my table stopped what they were doing to wait for my reaction. Well, I lived in Japan, suckas: once you've had to eat squid guts at a business meeting, no grilled sausage, no matter how funky, can move your facial expression. I won't be grabbing for more of this anytime soon -- but it is better than squid guts. New standard!